The Ethiopian Foreign ministry has issued this week a special directive to its diplomatic missions around the world to start countering Eritrea’s latest active diplomatic successes that aimed at fostering trade and economic co-operations besides garnering the much needed political support to end the politically motivated, U.S. engineered United Nations sanction on the country. The directive orders all Ethiopian diplomats and heads of missions to start immediate diplomatic activities and lobbying works within their respective host states in order to maintain the sanction imposed on Eritrea. Eritrea recently appointed 14 new ambassadors to carry out its renewed and active diplomatic maneuvers in a number of African, Middle Eastern and Asian countries. Some of the recent major diplomatic achievements includes the establishment of full diplomatic relation with Turkey and the signing of the first ever economic and diplomatic cooperation agreements with Moscow. Eritrea also renewed its active diplomatic engagement with neighboring countries like Uganda, Kenya and Egypt besides the excellent relation it enjoys with the two Sudans. It has also appointed new ambassadors to the EU and Norway after a European Union delegation visited Asmara and agreed to reactivate its development partnership program in the country. Sweden also showed interest in renewing its long frozen relation with Eritrea first by assigning a non-resident ambassador to Eritrea and followed by rejecting the looming politically motivated ban on the 2% Eritrean “diaspora tax’ in the country by the the Swedish Riksdag. Eritrea reciprocated the good gesture by appointing its first ambassador to the country in nine years. Eritrea also resetted its one time frosty relation with the United Nations after a delegation comprised of regional directors from UNDP, UNICEF, IOM, UNFPA, ILO and WFP headed by the Chair of the regional United Nations Development Group (UNDG) for Eastern and Southern Africa, Mr. Abdoulaye Mar Dieye, concludes a three days visit to Asmara. 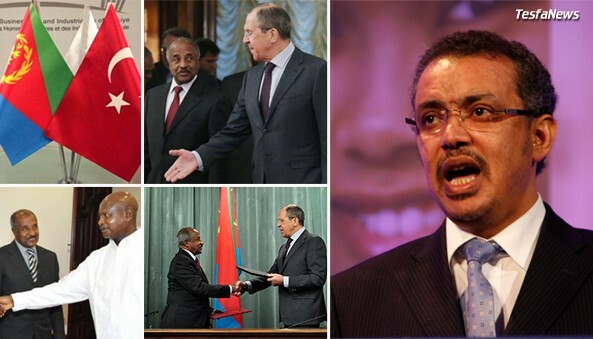 Eritrea reciprocated by assigning a new envoy to the world body. Such new developments are on top of the formal diplomatic ties the country enjoys with almost all UN member states and the over 30 Embassies and Consulates it has all over the world while it also hosting a similar number in its capital. In the face of such highly successful diplomatic gains within a short period of time along with the recent pronouncement by three prominent American diplomats on the legality of maintaining the sanction in the absence of any real or fabricated evidence linking Eritrea with Somalia rebels, the Ethiopian government have every reason to worry that such unexpected diplomatic successes might eventually lead to the lifting of the sanction. The Ministry’s directive stressed that the bulk of this new assignment will be conducted through its Ambassadors in Canada, Australia, Denmark, North and South Sudan, UK, USA, France, Germany, Israel, Italy and Norway. The directive finally concludes by instructing all diplomatic missions to report back to the ministry by the end of the month regarding the outcome of their assignments. When you are looking to pay someone to write your paper, online resources will help you to get help and get best authors. Hope this going to work. Playing politics with people's lives and freedom. It's time for principle over politics. Nice blog, very informative. I'll share it with my colleagues from the essay writing service. Interesting post. Thanks for sharingthis information. essaywritingstore.com is available around the clock. Stusents can order an essay at any time. Good stuff. Anyone would get the article at the essays writing companies and get best buy essay information and order essays accomplished by essay writers. Ethiopia is a country located in the Horn of Africa. it is bored by Eritrea to the north and northeast, Djibouti and Somalia to the east, Sudan and South Sudan to the west, and Kenya to the south. There are 90 million inhabitants. Once I had to write an essay about this country. I was busy, so I ordered essay online. Want to check how it works, you can try this out ! From the bottom of my small heart I really hope this works. Politicians abuse their powers in most unhuman ways. Thanks fo rthis good post. And first-rate essay writing service is available around the clock for students convenience. I hope they can resolve this problem and that they won’t have any more conflicts with each other so everyone will be at peace. Relax and everything will be good! I belive in it and you must try to be the happy! By the way guys, I want to advice a good tip, how to be relax in education! It is very easy and very comfatable! It is a professional online writing services ! They help you in your task! I study politics at college. It's an extra course, but I don't like it as I don't like politics at all. BHut I always get an A for my essays,because I order them at Custom-Essays-Online.com. Well, it is understandable that Ethiopian government have every reason to worry that such unexpected dimplomatic successes migh eventually lead to the lifting of the sanction. I was lucky to order my essay on this topic from these essay writers who know what to do in order to provide their clients with the perfectly written work. It is not surprising, that during the studying the students have to write a great number of essays on various topics. So if you get a task to write an essay about this beautiful country, but you feel it difficult to do, do not be afraid to ask for a help! custom essay writing is always ready to give you a hand of writing help! Mobile Application Development provides best creativity of android or window mobile application services. I know this is true but the real thing is that, all of the countries must work in favor of Ethiopia so that it may recover all of the issues soon. Last time when I had to conduct research on it, I had to buy dissertation online from some reliable writers.